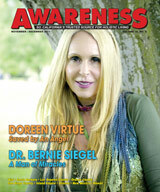 Dr. Bernie Siegel is truly an expert on the subject of miracles. Known to many simply as Bernie, his newest work is a collection of stories that abundantly demonstrates the capacity of intelligent, loving and conscious energy to transcend our limited human problem perspective. Appropriately, it is titled, A Book of Miracles. Bernie’s achievements extend far beyond the medical mastery it took to become a skilled surgeon. For more than three decades, Bernie has been on the forefront of those bringing humanity and spirituality back into the practice of medicine. His legacy has made an indelible mark on the direction of medicine in America. One of the most striking qualities about Bernie is his personal openness to what life brings, and the way he weaves new insights into an evolving and expansive outlook. His own experiential approach makes him a very unique form of spiritual ‘turnaround’ specialist. He helps others face big challenges by believing in the possibilities while courageously surrendering until something greater is realized. Throughout history, true healers have used their expertise to affirm life. Continuing this longstanding practice, Bernie has learned to combine medicine with love in a way that does indeed invoke the magic of miracles. His positive influence on so many lives has earned him a position of high regard — to be affectionately known as ‘Bernie,’ a way shower who is very adept in sharing wisdom. In his own words, Bernie describes his work as helping people ‘wake up’ to life. Confirming his well-deserved reputation, this past spring he was named by Watkins Review magazine, a longstanding publication in the United Kingdom, as one of the ‘100 Most Spiritually Influential People’ on the planet. Evidently his labor of love to lead the charge is going really well. Awareness: So what is your favorite definition of miracles right now? Dr. Bernie Siegel: To me, a miracle would be something that there really is no explanation for — like the Jewish holiday of Hanukkah, where you have a small amount of oil left and it ends up burning for eight days to give you time to produce more oil for the sacred candle. To me, that’s a miracle, because I can’t explain how it kept burning for eight days. What I’ve learned is, miracles are built into us. Creation, to me, is a miracle. None of us can explain it. Astronomers and quantum physicists live with things that they can’t explain and they don’t close their minds. That’s the sad part, I think, for most of the world, that when people can’t understand how something happens or can’t explain it, they just don’t accept it. Solzhenitsyn used the term ‘self-induced healing.’ So I’d say miracles, in a sense, are self-induced. There’s a desire; there’s an intention. Quantum physicists talk about desire and intention all through the physical world causing things to occur which would not normally occur if they were not desired. I always add the word “intention” because I think it has to be a meaningful desire, if you know what I mean. When we bring those things in, then we’re altering the physical world. Everything comes from nothing — undifferentiated potential. My description of God is intelligent, loving, conscious energy. So if you have those four things — intelligence, love, consciousness, and energy — you can create. Then the process is miraculous and the potential is always there to keep creating so that we have the potential to survive and live a miraculous life. Awareness: That is fabulous! One of the things that I really felt so deeply touched by is how much the stories give a sense that someone was grabbed by a healing crisis, and how he or she lived the question — opened to what you’re talking about, how the mystery of something greater can be brought into one’s life. To me, it isn’t this person sitting somewhere that’s going to do me a favor. It’s the energy that’s there and intelligence that’s there to help create whatever I would like have happen. So I always see that potential as being there, and you don’t have to die because this is what the numbers and statistics tell you. Who knows what the future is? When people are willing to get in touch with the life force within them, amazing things happen. Hemingway had a line, “The world breaks everyone; some of us become strong at the broken places.” To me, that’s the sad part. I think too often people need a disaster to wake them up to the reality of life. I always say to people, accept your mortality. Accept the fact that you’re here for a limited time, and don’t give your life away. Too many of us — due to parenting and other authority figures in our lives — become what others want. So we lose our lives. If I had to summarize it all, I say to people, live your life, and love your body. When your body gets the message that you are loved and your life is loved, it does everything it can to keep you alive. I mean, there is a chemistry to all this. Loneliness makes you more vulnerable to illness and laughter helps you to live longer. Why? Because of the chemistry that changes within your body when you deal with those emotional feelings. Awareness: Well, one of the things that you have such a gift with is helping people access that inner intelligence. I’m aware how we’re always accessing creative intelligence with our choices — we’re really participants in creation. You know? Dr. Siegel: Yeah. It’s amazing how powerful the mind is when somebody believes. That’s why I do a lot of work with dreams and drawings, because I always see us literally as multiple personalities. One is an intellectual personality; the other’s an intuitive one, amongst all the others. But if your intellect says, “No, you still want to do this,” and your intuition says, “This is the wrong thing,” then you’re going to have a lot of conflict and trouble and side effects if you go into a certain treatment. But if the two agree, then good things happen in terms of how you respond to whatever treatment or change in your life is going on. Let me add this: if you intellectually say, no, I don’t want to go through that, I don’t want that treatment, but you draw a beautiful picture, I say your inner wisdom knows it’s good for you; I would suggest you go and get it. You can work on your intuitive — you might say insight, too, by visualizing, meditating, and creating the images that you want to happen. So you can get your intuition to know that we can go through this without trouble and it’s okay, and then create that agreement within yourself so you have far fewer side effects. It’s almost like hypnotizing yourself. When you’re at peace with the treatment, and you see it as a gift from God, you have a very different reaction. Awareness: That’s one of the most potent points you’ve made, having the person really select the path that works by understanding the dynamics at work in their own dreams and drawings. Dr. Siegel: Yes ...I like the word “empowerment;” that you empower the patient, although I don’t like the word “patient.” It’s too submissive. I like to empower people to become what I call a “respant.” That’s a word I made up — a responsible participant. People are afraid to become responsible and to participate. They think, “If I don’t get better, it’s my fault.” That’s the sad part — that someone has grown up without love and with rejection and abuse, so the person is afraid to take on a challenge. Awareness: Again, that’s one of the things you make a great point about, giving up the fear of the outcome not being what someone wants. Do you want to speak to that? Dr. Siegel: Well, fear is there to protect us. What I mean by that is if you’re taking a walk and you see some creature that scares you, you can run the other way faster than you’ve ever run before. Fear can protect us from something. On the other hand, if every time you go out of the house to take a walk you’re afraid you’ll run into this creature, then it becomes destructive because your immune function goes down and stress levels go up. Ultimately you break your body down by being in fear all the time. Whereas, if you’re in love, if you’re in laughter, then your immune function goes up, and stress levels go down. So then you’re in a growth and healing phase. As I say, fear is visualizing the future in a negative way. So it’s creating just the opposite of what you would want. It’s getting your body thinking, okay, this is going to be a problem; everything’s going to go wrong. So, yeah, when you go into the situation with fear, then disaster happens. People get up and they don’t want to go to work, so Monday morning has more heart attacks, strokes, suicides, and illnesses. The body does you a favor and says, okay, you can have a heart attack; you can go to the hospital and you don’t have to go to work. Or you can die and you don’t have to work anymore. People need to understand — and I mean this literally — your body does not see death as the worst outcome; when you get tired of your body, it’s okay to leave; you’ll become perfect again. I have had a lot of interesting experiences in my life, too, that helped me to be open-minded and believe what I experienced. I almost choked to death as a four-year-old, so I know what it’s like to leave your body. I always laugh because I was mad as hell that I didn’t die. I mean, that may sound crazy to people, but when you’re four years old and you leave your body; you have no interest in going back. It’s just a fascinating thing that happens. So when things like that happen to you, it opens your mind so you see the world in a very different way. Another experience that impressed me happened while I was talking to a friend on the phone a few years ago. When she heard how busy I was, she said, “Why are you living this life?” I went into a trance and had a past-life experience, just in that sentence! It blew my mind because it taught me so much about myself and why I’m the person I am. Let me explain by saying that I’ve always been rescuing creatures. I mean our house is a zoo. Dr. Siegel: Now we have two dogs and four cats, but our home was like a shelter. Veterinarians would call me and say, will you take this animal, and I’d say, sure. We had squirrels and all kinds of exotic creatures in the house. The past-life experience explained it to me — that I was a knight who killed with the sword. It made me think, okay, that’s why you’re rescuing; to make up for all the damage you did. Maybe that’s why you’re a surgeon, to heal with a knife now instead of killing. So much of my life just came together out of this trance induced by a phone call! Again, you could say it’s crazy; it’s nuts, but all I know is it helped me, so I accept it as an experience, something I’ve lived with. I don’t have trouble recommending it to others because I really think that it’s about consciousness — this consciousness came with me; therefore I have this experience. There are some fascinating experiences that are documented with kids with past-life experiences. These kids can’t explain any of the things that they’re doing or saying, but when their parents start to research it, they realize, my kid’s not crazy. It could be even a child sitting down when they’re four years old to begin playing the piano. There are things that have preceded us and impregnated us when we are created, and therefore, affect us. Therefore, I would say that if we want the world to become a miracle, we need to all raise our level of consciousness and love one another, and then the future’s going to get to be a wonderful place. Awareness: With your story, I can really feel a sense of integration and reconciliation of something that didn’t get to be finished before. Dr. Siegel: Yeah. I call love a weapon, because if you love people, they don’t know what to do with you. People use arguments and justifying themselves, not admitting they could have done something wrong, and it goes on and on. The good people really learn from their mistakes. I always say if you want to find a good doctor, find one who’s criticized by patients, family and nurses, because they’re learning. As the Sufi poet Rumi said, ‘Let criticism polish your mirror.’ If you’re being criticized, it’s a good sign that people are comfortable talking to you, and then it helps you to change and grow. I think we can use each other as coaches. That’s the word I like. If a coach comes up to you during a ball game and says, let me show you a better way of doing something, you don’t say, ‘oh, my god, I’m a failure; I did it wrong.’ He’s showing you how to do it better. That’s what we need to learn from each other. When love is mixed in with it, then you can listen and know it’s coming from someone who is trying to help you. Then, as I say, love becomes the weapon that can change people and the world. You know, you look at people like Gandhi and Mother Teresa, the Dalai Lama — these are people who have had a powerful effect. I love reading about Gandhi because he caused the British all kinds of problems in India, but when an epidemic would break out, he’d stop and help them, and it confused them. How could they be mad at him when he’s helping them now? As I say, that’s the power of a nonviolent approach. Awareness: You make a comment in the book that I was going to save until the last because I thought, there’s nothing you can ask after this. That is, ‘love is the answer to every question.’ I thought that was the best statement. Dr. Siegel: I learned this as a doctor when a young woman said to me, “You are my CD.” I said, ”What do you mean, that I’m a CD?” She said, “You’re my chosen dad.” So I’ve learned to tell people, if they need a father, I’ll be their father. I will love them. I may not like what they are doing, but I will love them. That has saved a lot of lives, because ultimately, people realize they are worth something, or I wouldn’t have acted that way. Awareness: Oh, that is so beautiful! Dr. Siegel: Yeah. Those are some of the miracles — people who are alive today because I said, “I love you.” People literally were suicidal, and I said “I love you” and they turned it all around. By persisting in caring for them, I let them know they were worth something. On the other hand, they had to make the changes and accept it. It could take three months, six months, or a year, but if I kept on loving, I got through eventually. Dr. Siegel: Yes, and that’s why I say — people, teachers, clergy, doctors, the authority figures have such power over people. I don’t mean that in a negative way — what I mean is, power to help them survive. Think of a classroom. The teacher makes you feel worthy. What a difference. You don’t forget that your whole life. There are so many famous people that remember a teacher because of what that person did. Dr. Siegel: You know the key to me is living your authentic life. It can be said in many ways. Jesus said ‘He who seeks to save his life will lose it.’ What you have to lose is not your physical self — as you eliminate the untrue self, then you begin to live your authentic life.